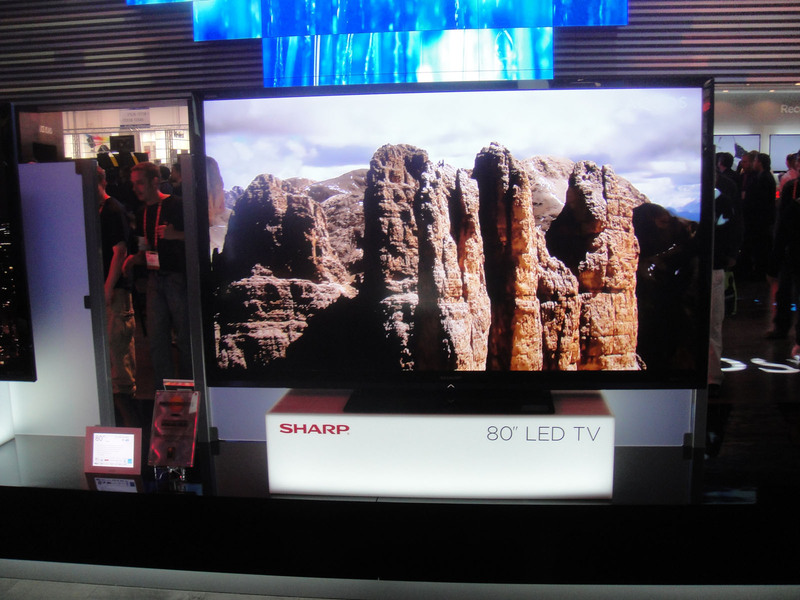 Television displays have been rapidly evolving since the inception of LCD technology in the late 1990s which almost kicked the CRT business out of the market. The world was only beginning to understand the LCD technology that LEDs surfaced which changed the course of history. 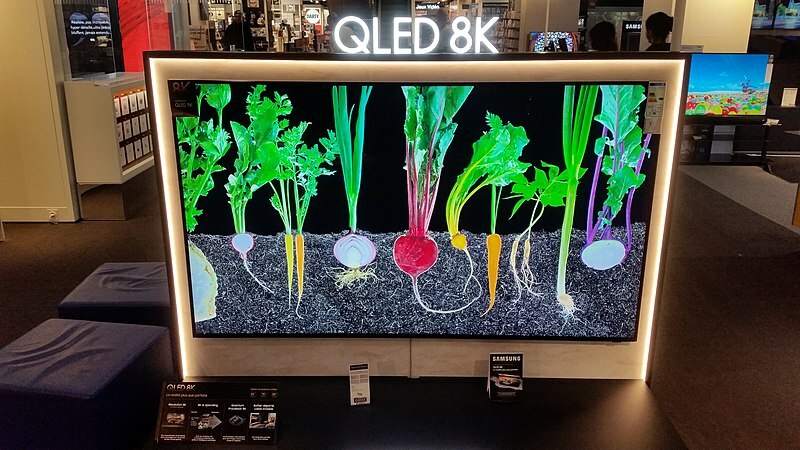 First it was LCD, then LED, and now we have more advanced and high-definition QLED televisions that are beyond anything we can possibly fathom. LED is more or less like LCD, but uses an LED backlight instead of the standard cold cathode fluorescent lamps used in most LCD televisions. QLED, on the other hand, is a whole new story – it’s the future of television displays that uses Quantum Dot’s electroluminescence to emit light. But the question is which technology is better? Let’s compare the two technologies to see who comes out on top. LED stands for Light Emitting Diode and it refers to a small, efficient light source that emits light when an electric current is passed through it. They differ from conventional CCFL-backlit LCD TVs in every way – they can produce an image with greater dynamic contrast compared to LCD TVs and they can be extremely slim. The basic technology behind the development of the LED dates back to the 1960s when a few scientists were working with a chip of semiconductor material, which was impregnated with impurities to create a positive-negative or p-n junction. LEDs basically come in two forms: Dynamic RGB LEDs which are positioned behind the panel, and white Edge-LEDs that are positioned around the rim of the screen in order to spread the light evenly behind the screen using a special diffusion panel. QLED stands for Quantum Dots Light Emitting Diode and they are the next generation of television displays marketed by Samsung to better describe their newer and much advanced LED TVs. Though it sounds more like the technology from the 90s or something, because of the term quantum dots, it really is the future of television displays, at least according to Samsung as part of its marketing ploy. But QLED is actually much more than just picture quality though. As the name suggests, it uses quantum dot technology to emit light by adding an extra layer of tiny particles in front of a regular LED backlight panel. This results in greater color accuracy, rich colors, dynamic contrast, and peak brightness. Though it may sound similar to an OLED, it’s a very different technology that enables over a billion colors. – LED TVs are more like LCV TVs that incorporate light-emitting diodes to backlight the display instead of the standard cold cathode fluorescent lamps (CCFL) used in most LCD televisions. Technically, LED refers to a small, efficient light source that emits light when an electric current is passed through it. QLED TVs, as the name suggest, use quantum dot technology to emit light meaning it adds an extra layer of tiny particles in front of a regular LED backlight panel which results in greater color accuracy and more pure and saturated colors. – The ability to produce deeper blacks allows a television to reach a higher contrast ratio which accounts for better picture quality. LEDs work with distinct RGB-colored lights to produce rich and sharper colors with greater dynamic contrast plus if offers a much wider color gamut with greater light intensity. QLEDs, on the other hand, offer incredible contrast with true blacks and bright whites. Because each pixel emits its own light, QLED TVs can run far more brightly than other display technologies in the market. – QLED is undoubtedly the clear winner when it comes to color volume as it is one of the powerhouses of features built into it. The quantum dot technology gives the new QLED TVs 100 percent color volume with unmatched saturation levels. This gives QLED a clear advantage over its LED counterpart in terms of picture quality. The expanded color volume results in near-perfect picture quality with more realistic, accurate and lively images. LEDs are not bad either but they aren’t good enough to rival QLEDs. – LED TVs are extremely good when it comes to brightness because they can get insanely bright and achieve peak brightness without consuming more power. The only problem with maximum brightness is power because TVs tend to reduce the brightness levels to save power while maintaining optimal draw of electricity. This is what exactly LED does – keep the electricity consumption lower without compromising the brightness level. QLEDs, on the other hand, use different technology altogether and they cannot reach optimal brightness level without consuming more power. – While LEDs and QLEDs both deliver nice viewing experience when you’re exactly at the dead center in front of the TV, neither of them are ideal for viewing when you’re sitting at far-off angles. The picture quality decreases significantly due to a hazy effect when you move off angle, resulting in a poor off-angle viewing experience. Because they use LEDs to backlight an LCD panel, it directly impacts the viewing angle which results in decreased color accuracy and brightness, loss of contrast, and luminance degradation. LED is more or less like an LCD, but uses an LED backlight instead of the standard cold cathode fluorescent lamps used in most LCD televisions. QLED, on the other hand, uses quantum dot technology to emit light by adding an extra layer of tiny particles in front of a regular LED backlight panel in the form of quantum dots. While both the display technologies are exceptionally good, they have their fair share of pros and cons. QLEDs trump LEDs on most aspects but LEDs are both energy-efficient and budget-friendly. If you don’t mind going on a premium side, QLEDs steal the show. Sagar Khillar. "Difference Between LED and QLED." DifferenceBetween.net. 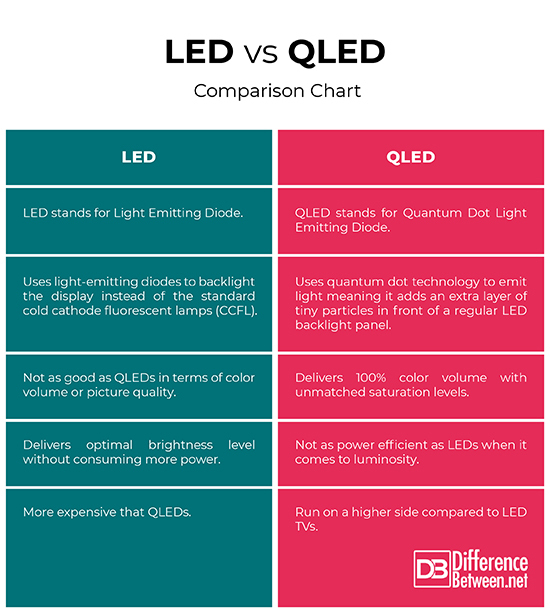 January 17, 2019 < http://www.differencebetween.net/technology/difference-between-led-and-qled/ >.